Endorsed by Cambridge International Examinations, the books cover the Cambridge syllabus (0455). 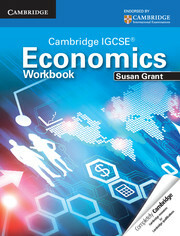 Endorsed by Cambridge International Examinations, Cambridge IGCSE Economics Workbook is designed to help learners develop their understanding of economics, to build up skills and to enable them to assess their progress.Cambridge IGCSE Economics Workbook can be used in conjunction with Cambridge IGCSE Economics Student Book by the same author but may also be used independently. Cambridge IGCSE Economics Workbook is divided into eight sections which correspond to the sections of the syllabus and the textbook. Each section, in turn, is divided into ten parts. Written by an experienced teacher and examiner in economics. Reinforces knowledge of the terms and emphasise the need for precision. Develops the ability to undertake calculations and provides learners with the opportunity to build up their numerical skills. Tests the learners understanding through numerous multiple choice questions. Develops the ability to interpret and draw diagrams. Susan Grant is an Economics lecturer. She has written more than 20 Economics books and is an experienced examiner.